Its not terribly exciting, but one of the things I really like is “doing nothing” with Jeff. We both work hard and long hours during the week and make it a priority to spend the weekends mostly together. Of course we’ll occasionally meet up with friends or run errands (Jeff goes golfing with the guys, I will meet up with friends for brunch or coffee, and so on), but most weekends will find us at home doing un-glamorous grown up things like laundry and cleaning the house. Often, and especially during the cooler months, we may spend whole weekends at home and barely leave the apartment. This is by no means an every weekend kind of thing, but during particularly busy seasons or after a grueling week, by mutual consent, we’ll decide to do as little as we can reasonably get away with. We call these “Slow Days,” and they have a very specific formula. Pajamas and exercise clothing feature heavily. Actual exercise is optional. Podcasts. It’s a bit of a family tradition but we normally listen to NPR classic “Wait Wait, Don’t Tell Me” together while we cook breakfast. Breakfasts are either roasted potatoes with eggs and avocados, or french toast. Almost without fail. We’ll play video games. Jeff is much more of a gamer than me, but there are some that I like and do play regularly. We may also play board or card games. We’ll read. I normally have at least one book and audiobook going at any given point, and Jeff will catch up on news. We are both political junkies, but we take Slow Days to catch up on a lot of the news that we might have missed in the sturm und drang of the day to day media churn. We will normally do a few chores to help justify our extreme laziness, but we usually do them together. At some point, because I’m hyper, I’ll get a bit bored and probably tidy something up or run a small errand. This is when my spice rack gets organized, or my pile of clothes that need to be taken to the dry cleaner gets separated from items for the regular wash.
Quite often, we’ll go hours not speaking to one another, even if we’re in the house together. Not in an unhealthy sense, but in a companionable silence sort of way that I’ve really come to value over the years. At the end of the day, there’s only a few people who I feel able to be “alone” with, without trying to be funny, clever, engaging, or “switched on” in some way. These people are my best friends (shout out to X. with whom I spent many a summer vacation day reading in silence–the stuff lasting teenage friendships are made of!) and my husband. When you give yourself permission to have a slow day, what does it look like and does it involve anyone else? A quick moment of apartment appreciation, minions. We’ve lived in our current place for two years and our lease is for a year more, after which we may either need to move or at least try to negotiate on rent a bit more. We struck a bargain when we moved in that we would furnish the place ourselves in exchange for lower rent and we have done so…very, very slowly. I don’t like living in what feels like a barebones apartment sometimes, I’m ready for a home that feels intentional and grown up, with art on the walls and furniture bought to keep instead of disposable IKEA goods. Simultaneous and paradoxically to that, I enjoy the ease with which we have been able to move, be it to another country or a new apartment on short notice. Owning fewer possessions definitely helps with that! However, the older I get, the less satisfied I am with living out of suitcases. Our first ever apartment in Utah was starving newlywed accommodation, our first London apartment was a shoebox and not very nice, but this apartment feels like the first proper grown up place. I’ve enjoyed the process of putting it together, even if that process takes a long time and is constrained by the realities of budgeting and strategy. We bought a bed and a wardrobe when we first moved in, for obvious reasons. Over the coming months, our next purchase was a couch, which again is fairly standard. From Etsy we bought a coffee table and stools, from John Lewis a rug. After about a year we splurged on our fabulous vintage chairs and then closed our wallets again for a long while. Furnishing is a balancing act. I’m a magpie who loves interesting, colorful pieces with personality while Jeff would be a Danish minimalist if he could. Smashing those two styles together into something that involves taste is a tricky, but I think we’re doing okay so far. He has his industrial tables, I get colors and patterns so long as the lines are modern. I get to do the majority of the selection, but he gets veto power so we don’t get overwhelmed with my magpie tendencies. It works. So when I spotted our latest piece online, I knew it would work too. It’s a vintage piece, but one that’s been upcylced. It’s a muted dark blue, which goes with the blue-gray leather of the sofa, and the blue and white rug. The gold touches keep it feeling chic instead of just a solid block, and it’s deep enough to absorb a lot of items that heretofore didn’t really have a home in the apartment–thus tidying up mess and satisfying Jeffs desire for lack of clutter. I’m absurdly pleased with it and it really has helped me feel as if the front room is “finished” in some way. The only other thing I would want to do in this current apartment would be to frame and hang our art, but if that doesn’t happen until our next lease somewhere, I think could be satisfied. We have lived in our apartment for over a year and have only just made an embarrassing discovery. We have a cutlery drawer. How could you just have discovered this, you ask? Part of the reason we decided to move into this apartment was the fact that it had recently been renovated and a brand spanking new kitchen had been put in. It’s so shiny, guys, we nearly cried the first time we saw it. It’s not my Platonic Ideal of a kitchen but coming from the one room flat we lived in for three years that had one small cupboard stuck on a wall and about two feet of counter space, it’s downright Nirvana. The whole thing is designed for maximum storage and it’s nice to actually be able to put things away in an orderly fashion and cook with new appliances. One of those appliances is a flat topped stove with built in ventilation and other systems that I’m sure I don’t properly understand. It appeared as if some of the design of this stove was also built beneath the surface of the counter because it because there was some bulky hardware when I opened the drawers situated a bit further down. Turns out I should have tugged on the nooks and crannies of this a bit more because I found a random tab on it the other day and put some elbow grease into it…and this popped out. Jeff was in the other room and I had to call him over to make sure I hadn’t lost my mind. He too did a double take and demanded where this totally new drawer had sprang from. After shaking our head at ourselves a bit, we resigned ourselves to our stupidity and stocked the drawer. This is actually our first proper cutlery drawer of our married life. We begin to feel quite grown up. 2017 is off to a rocky political start but there are small pleasures still to be enjoyed and we at SDS believe in signal boosting the good things in life, no matter how small. Here’s a rundown of the media, beauty, and little luxuries that kept me healthy and functional this month. Share yours in the comments! Hot water bottle. Our new apartment is lovely but the insulation is not the best, plus we tend to keep the temperature lower for both money and environmental factors. Why else were lovely jumpers invented? At any rate, I tend to get cold at night partially because Jeff claims he overheats when he cuddles me too long (side eye) and partially because I have poor circulation in my feet. 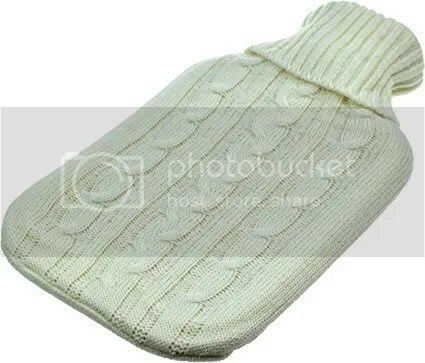 In looking for some kind of seasonal solution to this most wintery of problems, I noted that retro looking hot water bottles are everywhere in Britain in a way that I don’t remember seeing in the States. I always thought that hot water bottle were old school and a bit silly but eventually I decided to spring for one on Amazon (in late December, so it doesn’t violate my shopping ban). Kittens, I repent. I grovel. I abase myself for my ignorance. This thing is incredible. Pestle & Mortar. I have been test driving this beauty brand since December and it has been a good decision. A small company and based in Ireland, they ship worldwide and meticulously detail what goes into their small but impactful line. 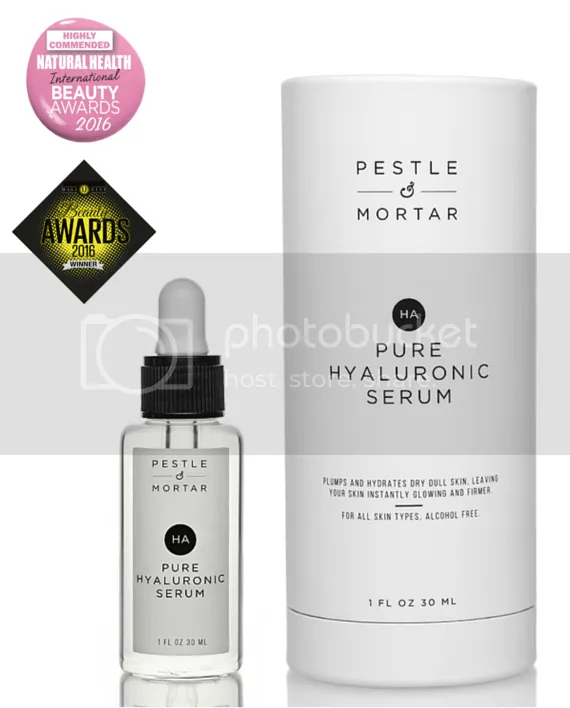 I’ve been using this serum and their nighttime retinol oil everyday this month and to say that it has been doing good things for my face would be an understatement! I gave the sample of their moisturizer included in my order a go and liked it so I will likely make that my next test drive when my current moisturizer runs out. 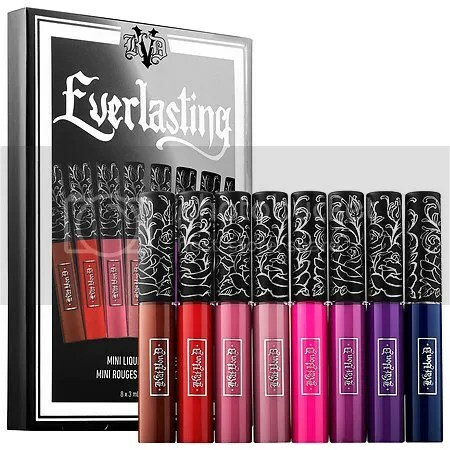 Everlasting Mini Liquid Lipstick Set, by Kat Von D. This was a Black Friday indulgence that I’ve been testing out ever since and it gets rave reviews from me. Very uncharacteristically I’ve been reaching for non-red lips this winter so far and this mostly cool toned set of colors has been scratching some kind of beauty itch. Excellent staying power and opaque pigmentation, with modern vamp colors–what more could a girl want? tarte Amazonian Clay 12-Hour Blush, in Seduce. Yep, another beauty pick, sue me. I’ve been having a bit of a neutrals moment lately (very out of character again, what is happening?!) and this blush is another of my Black Friday buys that I’ve been wearing almost exclusively ever since. The screenshot doesn’t really capture its tone accurately; I might have to throw another pic up on Instagram to show how it looks in the pan so keep an eye out there. 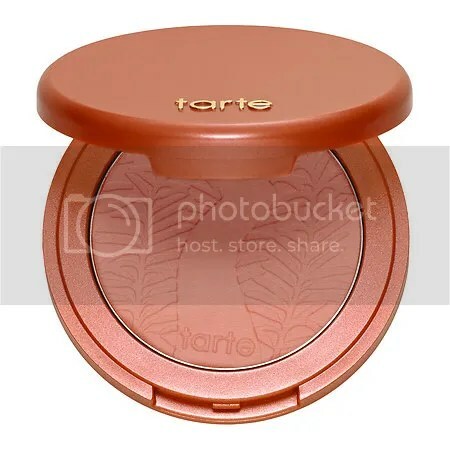 tarte expanded their line of blushes last year to include more neutral tones–previously they were known for the pigmented, bright colors of their blush so this was a bit of a departure for them–and the formula is just ace. To Walk Invisible, by the BBC. 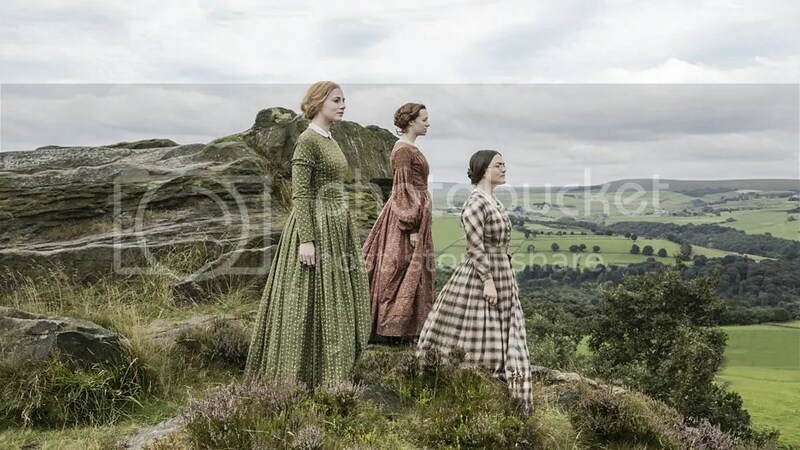 This period drama about the lives of the Brontes is not entirely unlike their works in some ways: quiet in places, slow, and intense in spite of (or perhaps because of) both. This film encompasses the last few years of their brother Bramwell’s life, when his descent into alcoholism and their father’s illness put their prospects for support as Victorian women into sharp relief. Their resolve is to try and publish their work, and the rest is well documented history. The moment that hit me most was when their manuscripts are returned from yet another publisher, and they immediately pull out their list of targets for the next one to contact. There’s a lesson in that.